Sad, right? Whenever I attempt to grow beans, I end up having to buy more beans to supplement what I grow. Because dinner with 5 beans to split between my husband and me as a side dish? That’s just not going to work. So when I made this Green Beans with Lemon-Almond Pesto recipe, I used my 5 beautiful, perfect, delicious heirloom beans and then bought the rest from the farmers market. The beans from the farmers market were delicious, but they definitely weren’t as pretty. Green beans and almonds are a classic combination, so I thought I’d try making a pesto with almonds to put my own twist on Green Bean Almondine. Green Bean Almondine is one of those dishes that I find myself loving sometimes and loathing others. When it’s done right, it’s so good! 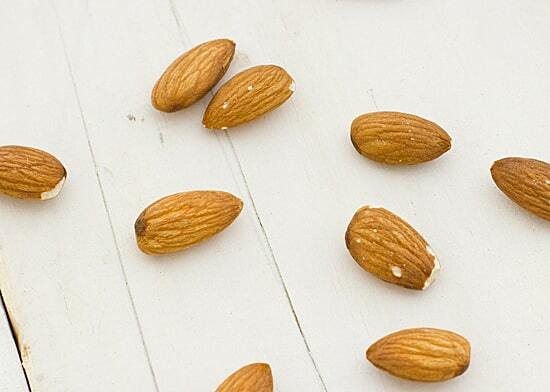 When it’s done wrong, those soggy little slivers of almonds bring absolutely nothing to the table. Unlike the soggy buffet version of Green Bean Almondine, the almonds really shine in this easy summer side dish. A bright note of lemon and the pungent flavor of garlic are the perfect addition to the traditional green bean and almond pairing. In fact, the pesto is so tasty, you might want to start putting it on everything you eat! 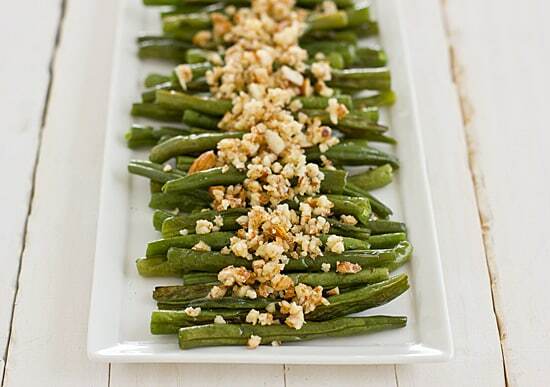 This easy side dish is a twist on the classic combination of green beans and almonds. Spray a rimmed baking sheet with cooking spray. Place beans on sheet in a single layer and spray tops with additional cooking spray. Roast for 15 minutes or until tender. Combine almonds, garlic, lemon juice, olive oil, salt, and pepper in food processor and process until roughly chopped. Spoon over green beans before serving. Sassy twist on a classic! I hear ya on the bean shortage. I tried for 2 years and gave up. But this reminded me I need to grab some at the farmers market. Do you have electricity again!? I hope so! I absolutely love fresh green beans. I can seriously eat them by the cupful. I think I’d really like this recipe of yours! Me too! Especially when they’re roasted–so, so good. And healthy! Your beans look gorgeous! Even though they are making themselves rare. I love the lemon pesto idea, beautiful. 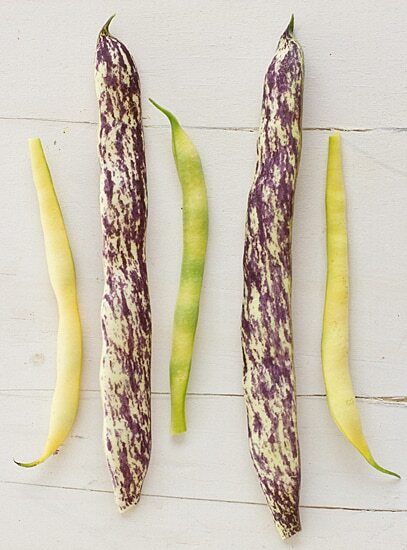 I know, I especially love the purple speckled ones–Dragon Tongue Beans. They are the tastiest beans I’ve ever had too, if they’d only grow more! What a neat new side dish for summer. Thanks for sharing this recipe. Of course! 🙂 I love green beans in the summer. This looks like an easy way to make green beans more sophisticated! I can’t wait for the sales on beans because I didn’t even try growing them from seeds this year. I think next year I’m just going to have to plant a lot more so I get enough to make recipes with (without having to buy more). The plants themselves seem to grow really well here, but for some reason I have an issue with yield. Yum!! Perfect example of good ingredients = good food without being overly complicated! Thanks for the great recipe. Beautiful pics too. i love love this side! so pretty, simple and perfect. Made this tonight, everyone loved the almond-lemon pesto. It was nice and lemony and also added a good crunchiness. Thanks for helping me dress up the green beans! I am so old school that I do not even own a hand chopper! I still made this dish despite my handicap and I served it for Thanksgiving! My family loved it! The flavor was still spot on and the dish was actually a huge success! I will be making it again next year! 😀 I had a little bit under 2 lbs. of green beans and I used a cup of almonds. I used two cloves of garlic, two tablespoons of meyer lemon juice (I am a HUGE lemon flavor fan), and one and a half tablespoons of olive oil. It just tasted marvelous (: Thank you so much for sharing this recipe! Oh, I love Meyer lemons too! I’m totally going to have to give this a try with them. 🙂 I’m glad it turned out well! I love this idea! I’ve never baked green beans like this and then to top them with such an awesome pesto?! Love it. Want to try it. Thank you.